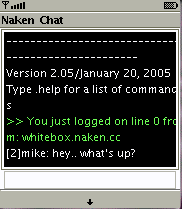 This little j2me midlet allows a user to log into my Naken Chat chat server that I wrote and talk to people online. Some time ago some Nokia phones were having trouble with this midlet (it was some bug in the phone that didn't allow 2 threads to control 1 Socket.. I originally had 1 thread to handle input and one to handle output) so my friend Devin Smith took my source code and made a new client (with new features). You can download his version from his website here: http://www.devinsmith.net/java.php. Just a warning: Logging into the chat with your mobile phone may cost you airtime. It all depends how your provider works. If you'd like to load the program on your phone using WAP, point your phone's webbrowser to: http://www.mikekohn.net/wap/.